New Kamen Rider Zi-O Magazine Scans Posted Online- Many New RideArmors Revealed! A plethora of new magazine scans detailing the upcoming adventures of Kamen Rider Zi-O have been posted online! 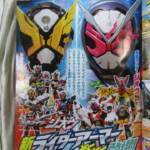 These scans give us some very detailed information about the next adventures of this time-traveling Rider. *The next stop on Zi-O’s tour is to the year 2011 and the world of Kamen Rider Fourze! WIth Fourze’s RideWatch Zi-O will gain the power of COSMIC ENERGY to activate the Kamen Rider Fourze RideArmor!This new Armor utilizes Fourze’s legendary Rocket Punch ability & can also transform into a Rocket Mode for direct attacks. *Zi-O is also shown obtaining the Kamen Rider OOO RideArmor! This new form based on OOO’s TaToBa combo channels all 3 animal abilities for combat. *Not to be outdone, Kamen Rider Geiz will pick up a unique souvenir from the year 2003- the Kamen Rider Faiz RideWatch, activating Kamen Rider Faiz RideArmor! This configuration gives Geiz several of Faiz’ own weapons, including the Faiz Shot & Faiz Pointer. *Perhaps the most powerful RideArmor yet comes from God Dan Kuroto– when Kamen Rider Geiz obtains the Kamen Rider Genm RideWatch to trigger Genm RideArmor! 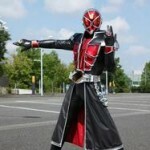 *The last confirmed stop on the Riders’ tour at the moment is to year 2012 and the world of Kamen Rider Wizard! 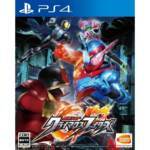 To obtain this Riders’ magic powers, the time-travelers must work with Kosuke Nito– better known as Kamen Rider Beast! Actor Tasuku Nagase will reprise his role as the mayonnaise-loving archeologist once again. Once the Wizard RideWatch is obtained, Kamen Rider Geiz will activate Kamen Rider Wizard RideArmor and be able to control magic itself! 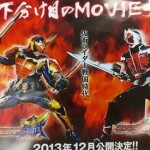 Definitely some exciting times ahead AND several tributes to Kamen Rider history along the way! Stay tuned to TokuNation as we keep you up to date on all Kamen Rider reveals. Kamen Rider Brave & Kamen Rider Snipe Spinoff Projects Announced! *Kamen Rider Brave will be the star of a Toei Tokusatsu Fan Club special release called You Must Survive! The Resurrected Beast Rider Squad! Brave will be forced to fight other Riders- Kamen Rider Beast, Kamen Rider Dark Kiva, Kamen Rider SaSword, and Kamen Rider Tiger! But leading the attack is none other than Takashi Hagino reprising his role as Kamen Rider Ryuki’s venomous Kamen Rider Ohja! This special will be released on February 19, 2017! *Kamen Rider Snipe will receive a special episode included on the second volume of the Kamen Rider Ex-Aid Blu-Ray release. Titled Kamen Rider Snipe Episode 0, this release will apparently explore the events of Zero Day– the day the Bugster monsters first appeared. Episode 0 will be released on July 12, 2017! A new image has surfaced online, revealing another entry in the Super Imaginative Chogokin action figure series- Kamen Rider Beast! This SIC redesign features a heavy emphasis on Beasts’ Lion elements, with some impressive new armor. Sadly, price and release details are not available at the time of writing. Stay tuned to TokuNation for further details! › Companies: Bandai Japan › Characters: Kamen Rider Beast › Show: Kamen Rider Wizard › Toyline: S.I.C. The newest promo for the upcoming Kamen Rider crossover film “The Faithful Sengoku Movie War” has come online, giving us another new look at the Rider Arms exclusive forms used by the new squad of Armored Riders! Wizard’s own movie promo is now online, featuring an early preview of the new magical world where anyone can henshin! Kamen Rider Wizard In Magic Land also premieres August 3rd! 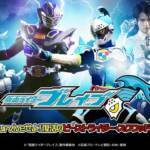 (UPDATE) Kamen Rider Wizard Summer Film Details- Kamen Rider Sorcerer and Mages?! As we get closer to the summer, new magazine scans reveal details for Kamen Rider Wizard’s Summer Film! Kamen Rider Sorcerer, the main Antagonist, is seen in the first image fighting Kamen Rider Beast. Also in the first image, is an image of his foot soldier, a Mage. And in the lower corner, we see what appears to be the Donut Shop Hungry Manager, Worker, and Shunpei each transforming into a Mage! 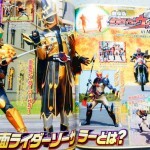 The second image brings more details about Kamen Rider Sorcerer. Transforming with his Sorcerer Wizard Ring, Kamen Rider Sorcerer has 3 other rings that have yet to be identified. The second image also shows the Mage Wizard Ring, which is how people in the film transform. And it also shows not just Shunpei, but also Rinko and Wajima preparing to transform to! Also judging by the image, it confirms that anybody can use magic and transform into a Mage! Stay tuned as more news is brought up! Edit: Updated with images of Sorcerer and his human form, who will be played by Japanese actor Takanori Jinnai. 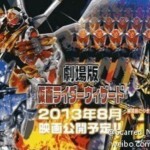 Thanks to an poster on 2chan we’ve gotten our first look at the Golden Wizard from the Kamen Rider Wizard Summer Film! 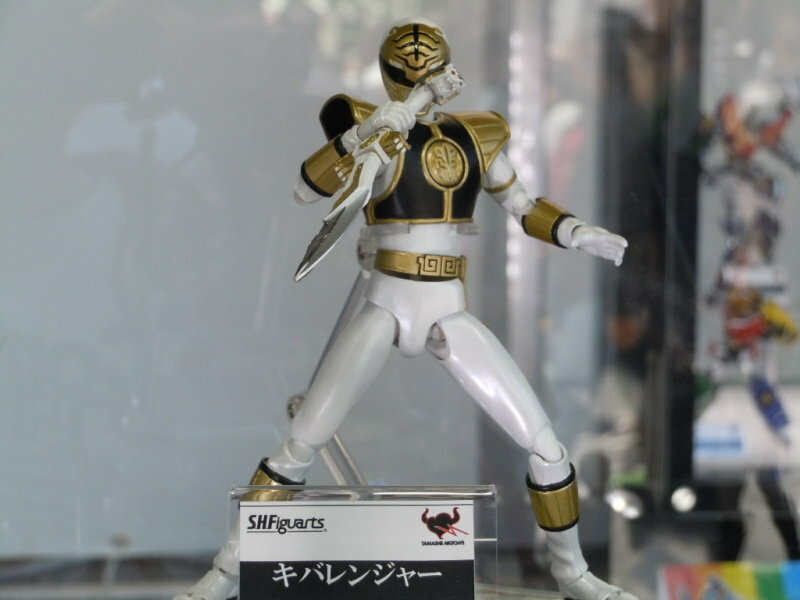 Golden Wizard sports a similar design to Wizard himself, albeit with a giant hat shoulder pads and cape. I’m getting a certain Magiking feel from him. Also seen in this image is the first glimpse of the army of Wizards said to appear in the film. According to leaked rumors about the film everyone will become Wizards for a brief time. 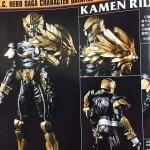 S.H.Figuarts Kamen Rider Beast Hyper Officially Revealed! First mentioned in the new list of Web Exclusives yesterday; Tamashii has now opened their order page for Kamen Rider Beast Hyper! Thanks to member irsyadsway for noticing!